“Operation Son Sun” investigation concludes with convictions of leaders of one of Delaware’s largest heroin trafficking organizations. 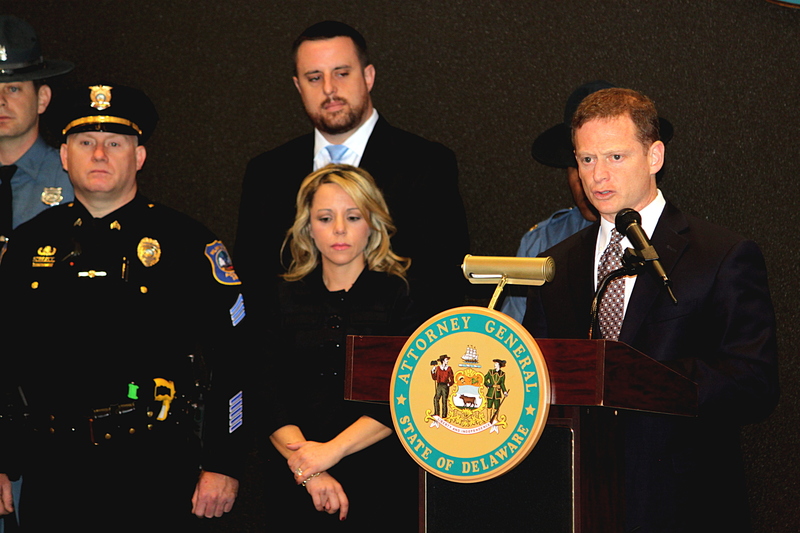 Attorney General Matt Denn joined with prosecutors and law enforcement officers from federal, state and local agencies to announce convictions of members of heroin trafficking organization. Joined by the local and federal law enforcement agencies who successfully worked together to bring down one of the largest heroin trafficking organizations in Delaware history, Attorney General Matt Denn announced Thursday that the prosecutions of “Operation Son Sun” defendants had concluded with guilty adjudications for 46 defendants and multiple-decade sentences for the leaders of the organization. The successful prosecutions were highlighted by the recent sentencings of Andrew “Rock” Lloyd, 32, of Wilmington and Antoine “Flock” Miller, 35, of Wilmington. Lloyd led one of the largest heroin trafficking organizations in Delaware history before it was shut down in December 2014, after a multi-agency investigation. Known as “Operation Son Sun,” the investigation included the Delaware Department of Justice, the Drug Enforcement Administration-Wilmington Office (DEA), the Wilmington Police Department, the Federal Bureau of Investigation (FBI), the New Castle County Police Department, the Division of Probation and Parole, the Newark Police Department, and the Delaware State Police. The final indictment charging 46 people was handed down on December 22, 2014. One year later, all 46 persons indicted have pled guilty or been convicted of criminal offenses. Lloyd was sentenced to 25 years in prison, followed by probation for charges of organized crime and racketeering, six counts of Tier Five heroin possession, six counts of Tier Four drug dealing heroin, drug dealing with an aggravating factor, Tier One drug possession with an aggravating factor, possession of drug paraphernalia, and eight counts of second degree conspiracy. Miller was sentenced to 20 years in prison followed by probation for charges of organized crime and racketeering, Tier Five heroin possession, possession of drug paraphernalia, and two counts of second degree conspiracy. “The cases brought against this criminal enterprise demonstrates the strength of law enforcement’s dedication to stopping dangerous criminals in New Castle County. This isn’t the end game for the FBI or our law enforcement partners. We are continuing to go after the criminals who are creating violence and fear in our communities,” said Kevin Perkins, Special Agent in Charge of the FBI in Delaware.